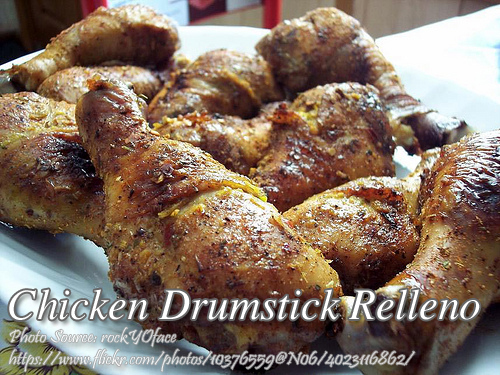 There are different ways of cooking chicken drumsticks. You can cook it as stew, soup, fried, grilled or roasted. There are also different kinds of marinades if you are going to grill it. This recipe I have here is quite unique because it is a chicken drumstick stuffed with it’s own minced chicken meat mixture and the bone is still attached. It is a relleno style stuffed chicken. Preparing it is a little tedious because you have to remove the chicken meat and leave only the bone and skin. The skin should not break while removing the meat because it will serve as a wrapping for the minced chicken mixture. But in case the skin breaks or there are little skin left, you can wrap it with caul fat or leaf lard to retain its shape and to avoid messing up the stuffing. Wash chicken legs in running water, clean and drain. Carefully push down skin to the end of the bone. Try not to tear the skin. Scrape meat from bone. Season skin with little salt and granulated seasoning. Set aside. Grind or mince the chicken meat, ham and sausage and mix with ground pork, pickle relish, onion, eggs and flour. Season with granulated seasoning, salt and pepper. Pack well mixed ingredients around the drumstick bone with skin holding it. If the skin is torn, wrap with sinsal (leaf lard or caul fat). Dip in beaten egg, then roll on bread crumbs. Fry in deep, hot cooking oil until golden brown. Serve with catsup.